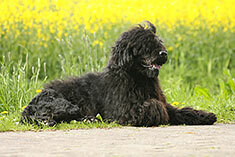 The Portuguese Water Dog is a medium sized dog with heart-shaped ears that hang beside its head. Its legs are straight, strong and parallel and the toes are webbed which aids in swimming. 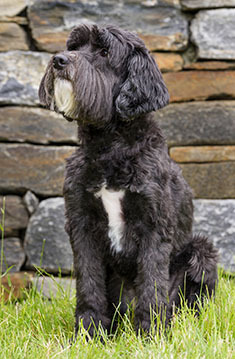 Portuguese Water Dogs may be black, white or brown, parti-color (white with dark spots), black or brown with white markings, or even silver fox or gray. The Portuguese Water dog is a non-shedder. It has curly or wavy hair that should be brushed or combed regularly. The Portuguese Water dog is a highly intelligent breed and used to be used primarily in the Portuguese fishing industry to guard boats, carry messages between boats and retrieve anything that fell overboard. This breed gets along well with children and other dogs and is highly intelligent, affectionate and loyal. Portuguese water dogs respond to tone of voice. Susceptible to hip dysplasia and PRA. Breeding stock should be tested for GM-1 Storage Disease, a fatal nerve disease that appears when a puppy is six months old. The Portuguese Water Dog can be expected to live about 10 to 14 years. The Portuguese Water Dog can do well in an apartment as long as it is sufficiently exercised. In temperate climates Portuguese water Dogs can live outside, they prefer however to be close to their families. This breed loves to retrieve sticks or balls and makes and excellent jogging companion. Porties have a curly coat like many water dogs. Affectionately known as the Portie or the PWD, the Portuguese water dog gained instant popularity when President Obama acquired one for his family. Before this, the PWD was relatively rare, ranking 64th out of 161 dogs on the American Kennel Club’s list of most popular dog breeds in the United States. This ranking is expected to rise dramatically in 2009, and experts are hoping that the dogs are not abandoned at shelters as their guardians realize they did not know what to expect. Doggies.com presents this breed guide to help prospective puppy purchasers set realistic expectations before they commit to getting a Portuguese Water Dog. How was the Portuguese Water Dog breed developed? The Portie breed was differentiated from the others along the coast of Portugal, where he was of great value to fishermen as a companion, working dog, and guard dog. On fishing boats, he was used to dive into the water and herd fish into nets. He could also retrieve things that fell overboard such as tackle or other equipment. Finally, he could carry messages between the boats or from a boat to the shore. As the small-boat fishing trade died out along the coast of Portugal, so did the PWD breed. It was revived in the 1930s, nearly single-handedly, by wealthy Portuguese shipping magnate Vasco Bensaude, whose stud dog Leão was bred to so many females that about half of all existing PWDs can trace their ancestry back to him. In the United States, Deyanne Miller was instrumental in forming the Portuguese Water Dog Club of America, popularizing the breed here. One early member was actor Raymond Burr. What does the Portie look like? PWDs grow to be about 17 – 23 inches tall and weigh from 35 – 60 pounds, with the males falling at the higher end of the spectrum and females at the lower end. The PWD is similar to many other water dogs, having a curly coat and webbed toes. However, they are more stout than Poodles, and may have a wavy coat rather than the hair being tightly curled. The hair on a Portie continues to grow throughout the dog’s life, requiring that trimming be done every two months or so. Frequent brushing is required to keep the fur from becoming matted between trimmings. Porties may be black, brown, black and white, or brown and white, and the coat color often fades as they get older. Some dogs even grow white hairs among the dark ones as they age, causing a “blueing” of the coat. The most common coloring is black with a white spot on and under the chin, known as “milk chin”. In rare cases, a dog may be mostly white with a few black spots. The coat has only a single layer, rather than the double-layer present on many breeds. The absence of an undercoat means that this breed does not shed very much, making it a good choice for homes where allergies are a problem. However, it should be noted that all dogs have dander, which is deposited in the home in the dogs’ saliva and dead skin, so no dog is truly hypoallergenic. An allergic person should spend some time around the dog he hopes to purchase to make sure he doesn’t react to the particular dog he has in mind. If you think this description sounds familiar, and you are wondering where you have seen the dog, consider that Senator Ted Kennedy has often been photographed with his three Porties. In addition, if you’ve ever seen a San Francisco Giants home game on a Sunday, you may have seen the team of PWDs that retrieve home run balls from the waters of McCovey’s Cove at batting practice and during the game. How do Portuguese Water Dogs act? These dogs make excellent companions, as they are intelligent and loving, but independent. They will sit at their human’s side, just waiting for a command to carry out. They are easily trained for agility and other sports, as well as for obedience. This is not a breed that will take off running at any opportunity, preferring instead to stay close to the family. Although this breed is generally thought to be too small for use as an assistance dog, they are very well suited to assisting hearing-impaired people. They are easily trained to respond to noises, alerting the person that the doorbell has been rung or that the dryer buzzer has sounded. The PWD has also been found to be a great therapy dog, being given the job of comforting the sick or listening while a child reads to them. As can be inferred from the above, the Portie is a social dog, preferring companionship to being alone. This is not a dog who can be tied outside and left alone until feeding time, nor is it a dog who will enjoy being left home alone while the people of the house are at work all day. What PWD behaviors cause problems? Because the Portie was bred to retrieve things from the water, he has a strong retrieving instinct, which can translate into a tendency to chew and tug on things around your home. This can be curbed by providing the dog with appropriate chew toys whenever he is caught chewing on something inappropriate. Porties often dance on their hind legs when they are excited. If a person approaches who the dog is excited to see, the dance turns into jumping up onto the person, which can be dangerous if the person is not prepared or able to withstand the force of the jump. In the kitchen, the dance can easily turn into counter-surfing as the dog looks for spare crumbs or even a whole roast! The dog’s intelligence may also cause problems, as he requires mental stimulation to keep from getting bored. A bored dog is a destructive dog, so guardians must provide regular exercise and a “purpose” for the dog in the form of useful work such as fetching a Frisbee or guarding the home. 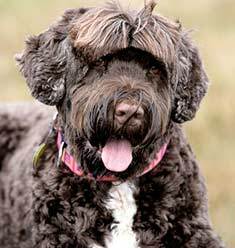 What diseases afflict Portuguese Water Dogs? Like most large dogs, PWDs are susceptible to hip dysplasia. People considering buying a puppy should ask to see the parents’ OFA certification of hip health before putting down a deposit. Porties also are at risk of developing certain genetic eye diseases such as progressive retinal atrophy. In this disease, the retina of the dog deteriorates with age, leading at first to night blindness then to total blindness. The DNA of prospective breeding stock can be tested to make sure the disease is not passed on. A dog with no trace of the gene for PRA is known as an “A” dog, while dogs with one copy of the gene are known as “B” dogs. B dogs will not actually have the disease, but will pass it on to their offspring. “C” dogs have both copies of the gene, and will develop problems. B and C dogs must only be bred to A dogs to assure that their offspring won’t be affected. Even better, breeding only A dogs would eventually eradicate the disease! Like most curly-haired dogs, Porties are known to develop ingrown eyelashes, a condition known as distichiasis. Treatment is available, and should be pursued to prevent irritation of the eyes. A Portie who develops depression, vomiting, weight loss, and a lack of interest in food should be evaluated for Addison’s disease, a problem with the adrenal glands. These glands, located just above each kidney, are responsible for controlling sugar metabolism and maintaining salt and water balance. When they deteriorate, they fail to produce the hormones required for these important functions, causing the symptoms discussed above. Finally, and perhaps most importantly, PWDs may develop Juvenile Dilated Cardiomyopathy, a genetic disease that causes puppies to die suddenly due to heart failure between the ages of five weeks and seven months. There is no cure for the disease, and no way of knowing which puppies will be afflicted. However, responsible breeders will keep track of which dogs have produced puppies that have the disease and will not breed the same parents again. If you are looking for an intensely loyal, intelligent dog that rarely sheds, the Portuguese Water Dog will be right up your alley. However, if you want a dog that is quiet and able to entertain himself, you should look elsewhere. Find Portuguese Water Dog Puppies with our Free Breeder search!